Male Model #1: Do you know a guy named Craig? Me: Craig? No, I don't think so. Is he from around here? Male Model #1: Well, it's this dude and he has this list. And you can find anything there. Male Model #1: Well, you can find all sorts of stuff on there. Me: Yeah, It's a great website. Male Model #1: I actually found this job on the website so I tried to email Craig with a question, but I got a Mailer Demon. Do you know what that is?? Me: (Dumbfounded) The email got returned to you? Male Model #1: Yeah, but it was from someone called Mailer Demon. Do you how I can get in touch with Craig? Male Model #2: Is his phone number on the site? I think I am going to submit this to Overheard in New York. It might be breaking the rules because I was involved in the conversation. Nevertheless, I am in love with that website. And just for the sake of it, here's a link to Zoolander on IMDB for obvious reasons. Tomorrow I'm back to filming with more models. I can only hope the conversation will be this juicy. I recently acquired some golf clubs. I am going to get back into the game. Golf is one of the great mysteries in life. Like bad relationships, it can be so painful yet we keep coming back to it. We think, "this time it will be better." Like clock-work, the last shot I hit on the day was so beautiful. Perfect swing, Sounded just right, perfect arch, right on the green... well, now I have to go back and golf again. The golf gods have teased me and won. However, when I was at the driving range this weekend I discovered a phenomenal idea. I don't know how many courses / ranges do this, but it was a first for me. After purchasing a bucket of driving range balls, she asked if I would like to play their 3-hole course. 3-hole course? I knew that I didn't have time to pay 9, but 3? Sure! Driving range wins another $5 of my money. Great up-sell. So I hit my range balls and then played 3 holes. It was great. It didn't require the time commitment or the "frustration commitment" of 9 holes and I got to try out a few new tips that I learned at the range. Why aren't more people doing this? Take a note from Saskatoon Golf Course. You may find that in your business you can offer a "smaller taste" of your offering that will then entice them to try a little more. The iPod is a great example of this. While making the switch from a PC to Apple computer is a "big" decision, purchasing an iPod is a relatively easy decision. However, after purchasing you get a little taste of what it may be like to own more apple products. When you go the Apple store to purchase iPod accessories, you can't help but notice how gorgeous those new computers look. You are pleased with your iPod, maybe Apple has some other great products. And you're sold. With some of our current web properties, I want to investigate the possibility of creating smaller items that hold very unique value to sell / offer on the site. Then when people show up, they will look around and take notice of some additional products that previously might have been a bigger decision on their own. Sometimes people need to be eased into a purchasing decision. Essentially, we have to hook them with a little taste up front of what we have to offer in order to show them that they will be pleased in the long run. Many of you may have just graduated college. Many of you plan on graduating in the future. A few of you may want to try again... But it's mid-June which means that the recent grads with no jobs are starting to panic. There's nothing more invigorating that the cold rush of harsh reality that college is finished and now it's time to go get a job! However, be warned... They aren't all "family-friendly". If you would like to be HELPFUL to the recent grads, here is a downloadable PDF courtesy of Drew's Marketing Minute. It's full of sage advice from recent college grads and seasoned pros who share some helpful hints and painful stories of what to do and what NOT to do while looking for that first job. I highly recommend checking it out. If you know some recent grads, send them a link to my blog and advise them to download it. Maybe they'll find something else they like here. Enjoy! "Branded Content is a relatively new form of advertising medium that blurs conventional distinctions between what constitutes advertising and what constitutes entertainment. Branded content is essentially a fusion of the two into one product intended to be distributed as entertainment content, albeit with a highly branded quality. Branded content, unlike conventional forms of entertainment content, is generally funded entirely by a brand or corporation rather than, for example, a film studio or a group of producers." So, what are some examples of "branded content"? I'll start with my favorite and quite possible one of the finest truly original examples, The BMW FILMS. Another favorite is Phillips Norelco. Yes, man-razors. Never have I been so entertained by a website "commercial"! I may even buy one of these trimmers just because of this site. If you haven't seen it, I highly recommend it. Next, a very different variety: Burger King is famous for their branded content, namely Subservient Chicken and their new site, Pet Mustache. They also created commercials in the form of video games for the XBOX: Sneak King. The basic premise is that agency creatives sit around and think, how can we entertain our target market and advertise to them? As long as our potential consumers are having fun, they don't care that they are being advertised to. For the past (however many) years, the point of advertising has been interrupting people. You advertise by stopping your target audience and saying, "Hey, Look over here!". Branded Content provides content information / entertainment that viewers choose to seek out. They typically go to the web because it is more complex or engaging than what is able to be accomplished in a simple 30-second commercial. Because consumers or users are better at conveying the true essence of a product than any advertising agency. So what are the advertising agencies doing? Well, when you can't beat them, join them. I'll dive more into this tomorrow but tonight I leave you with this. Here is KFC's new campaign featuring, well... you. I like maps, but I am 'in love' with strange maps. As I browse the internet, I love to find pertinent (or at least amusing) information displayed in new ways. So, e-props to Dan Pink (thinker / author / speaker). He is the author of A Whole New Mind - Why Right Brainers will rule the future. He points us to a blog entitled Strange Maps. Click on this photo to enlarge it and check it out. It is a map of the US showing states renamed with countries of similar GDPs. I must say, there are some shockers on here! Ohio = Australia, Illinois = Mexico... Rather fascinating stuff! Here is another "Strange Map". It is the geographical representation of the Pop vs. Soda debate. Finished reading "THE DIP" by Seth Godin. It's a good book. It's a quick read and the main points are inescapable. All said and done, winners know "when to quit and when to stick". "Persistent people are able to visualize the idea of light at the end of the tunnel when others can't see it. At the same time, the smartest people are realistic about not imagining light when there isn't any." Old School "See N' Say"
I would like to offer a special internet Boo-yah to my wife who found me this picture of the original See N' Say, circa 1985. Actually, I have no idea what year it is from. This picture is in response to yesterday's blog. Check that out so you know why on earth I am putting pictures of See N' Says on my blog. The 'Word of Mouth' says... MOOO! Do you remember this toy? 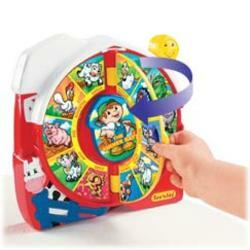 I have extremely distinct memories of this toy. It has all the different animals on it and then you pull the string and it says, "The (animal) says... (insert appropriate animal sound). However the picture on the left is like "See n' Say 2005". I need a pic of See n' Say 1985... If you can find one, send it over! Yesterday, I was reviewing The Tipping Point by Malcom Gladwell, and I realized that in the new version he has an updated "afterword" section. This pretty much means that he thought of a few more good points and inserted them into the book years after it was originally published. It's like after you would get done taking a test and wanted to go back and put that one additional sentence on your essay to really pull it all together. Well, you can't. Be he can. He can do whatever he wants. Write two New York Times Best Sellers and you can too! So anyway, he made the point that "Word of Mouth" is important. Surprise right? But then it made the point that it is more important that ever. Why? Well it got me thinking. You can get any type of advice you want depending on who you talk to. With so much access to information, we have the ability to surround ourselves with people, websites, reviews, who offer the advice that we like to hear. This is why we bookmark specific sites for movie reviews, go to specific churches or ask advice from the friend we know is going to agree with us. We are pros at predicting "word of mouth", so we trust the words of those trusted sources. The Mom says... Get a job! The Vince Lombardi says... Winners never quit! The Seth Godin says... Winners are the best quitters! The Financial adviser says... Diversify! The Personal Strengths developer says... Don't diversify! The David says... You get the point. With as may websites, books, sales scams, blogs, product sites, fake product sites, reviews by pros, reviews by amateurs, reviews by small mammals, etc... You can pretty much find any opinion you want! THEREFORE, how much MORE important is it that your friend, who you know, who you trust, tells you that Product X is phenomenal. This means that you are probably going to check it out, no matter what any of those other sources say, good or bad. Had you looked on line to discover this, you might have googled it, and who knows what you might have found!? With an overwhelming amount of information offering you a wide variety of opinions, the 'word of mouth' advice from the people you trust becomes all the more important. Love it. 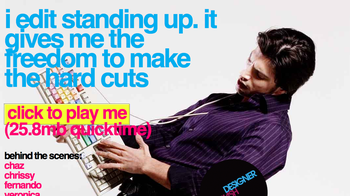 Check out this brilliant site for Designers Slash (/) Models. "Perfect people create perfect designs." "Design can change the world, I think crop circles prove that." "You have to be beautiful to create something beautiful."